The result of an international competition won by Chicago architects Walter Burley Griffin and Marion Mahoney Griffin in 1911, Canberra’s city plan is based around geometric motifs (circles, hexagons and triangles) on axes. 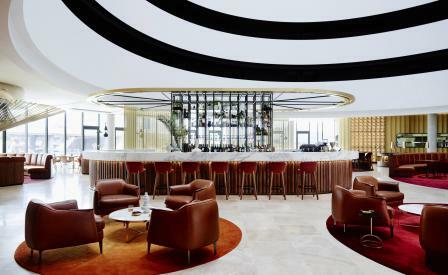 Inspired by this mathematical layout, the city’s newest hotel - by global architecture and interior design firm Bates Smart - features a striking circular atrium, with alternating black and white rings, that leads six-storeys up to a skylight that sheds a vivid cast over the open-plan foyer, restaurant and bar below. Here, the spherical theme continues; a central marble bar is orbited by caramel leather armchairs that are arranged on round burnt orange rugs, curved half moon booths, which grace the restaurant and a dramatic round Calcutta marble fire place in the lounge - which surrounded by low-slung seating - is where guests can mingle over a glass of wine or a cocktail. Around the perimeter of the atrium are the 191 guest rooms, where the circle manifests itself by way of the penny tiles in the bathrooms and bronze rings that screen the floor-to-ceiling windows, adding a touch of quirky substance without distracting from the views outside.